Do you clean your own gutters? Change the oil in your own car? Bake every birthday cake from scratch? I’m guessing you don’t do many — if any — of these things. And you shouldn’t proofread, either. Proofreading is a specialized job requiring someone with talent and training. I’m not a natural proofreader myself, but I know how to hire excellent ones. They should cost about $40/hour. (1) Allow some time to pass after you finish writing/editing and before you start proofreading. We all make unconscious mistakes and they are hard to spot because our brains “fill in” the correct word. You may have meant to write trickier but somehow it came out as tricker. The trouble is, if you’re familiar with the story, your eye will glide right by the error. If you take a break, however, you’re far more likely to catch the problem. (2) Print out your text and proofread on paper. In part, because using a computer shines a light in our eyes, we all read material on screen much more quickly and less carefully than we do in print. Try to print out your work before proofing it. (3) If there is some reason that prevents you from printing, use a distinctive typeface and dramatically increase the point size before proofing. When I am forced to proof on screen, I like to use Papyrus or Candara 18 point – this makes it easier to spot errors. (5) Check what I call the “ big, obvious yet somehow invisible” stuff. By this, I mean logos, company names, and extra-large headlines. Ironically, the bigger the type, the more likely you are to miss a typo. (6) Start at the end. Professional proofreaders often read at least once backwards. No, I don’t mean they read the words backwards. I mean, they read the last sentence first. Then the second last sentence, then the third last sentence…until they work their way back to the beginning. This forces them to read each sentence in isolation – breaking the familiarity with the piece that might cause them to miss errors. (7) Put a ruler underneath each line as you read the text. This forces you to work much more slowly and stops your eye from jumping ahead. (8) Consider what you might have left out. For instance, if the piece requires an RSVP, it needs a phone number or e-mail address to which someone can respond. It should also have the date of the event and an address. (9) Make a list of your own common spelling or grammar errors and check for those specifically — do you mix “affect” and “effect” for example? (10) Read your work aloud at least once. You’ll catch a lot more errors this way. 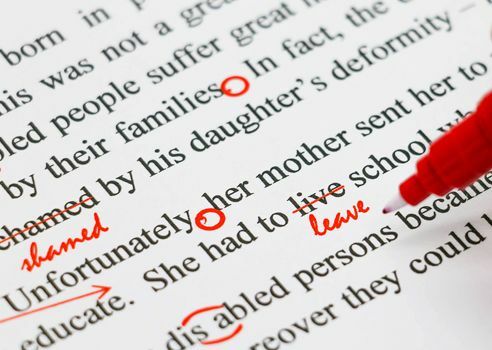 What are your proofreading secrets? We can all learn from each other so, please, share your thoughts with my readers and me in the “comments” section below. Anyone who comments on today’s post (or any others) by Sept. 30/17, will be put in a draw for a copy of Becoming an Academic Writer by Patricia Goodson. Please, scroll down to the comments, directly underneath the “related posts” links, below. Note that you don’t have to join the commenting software to post. See here to learn how to post as a guest. This post originally appeared on my blog on Feb. 7/14.